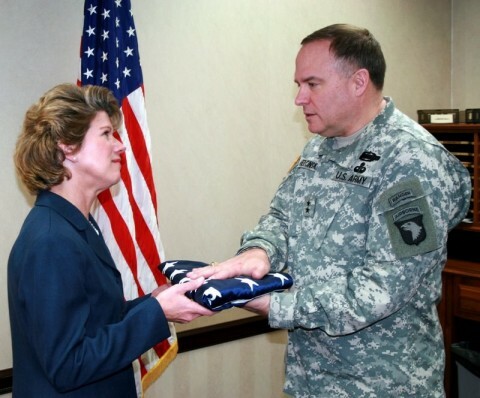 Clarksville, TN – Mayor Kim McMillan was presented an American flag on Tuesday that flew over headquarters of the 101st Airborne Division at Bagram Airfield in Afghanistan. Maj. Gen. Frank Wiercinski, administrative senior commander at Fort Campbell, personally delivered the flag and a plaque to the Mayor’s Office on behalf of Maj. Gen. John Campbell, commanding general of the 101st, who is currently in Afghanistan. Maj. Gen. Frank Wiercinski, right, presents an American flag that flew over 101st Airborne headquarters in Afghanistan to Clarksville Mayor Kim McMillan. He also thanked the city for observing Veterans Day to honor those who previously fought and sacrificed for freedom, as well as those currently serving. Wiercinski said the commanding general sent three flags back to post – one each for Clarksville, Montgomery County and Oak Grove, KY. The plaque reflected most of Campbell’s comments in his letter.